B I R T H - S E A S O N : The peak of winter. P H Y S I Q U E : Ares is larger than the average male, mainly because he has long powerful legs. His frame is only slightly broader than the common adult male. His build was designed for brute power, with a large muzzle full of long sharp ivories, to his wide paws to support his structure. Along with his broad paws, he has long and sturdy talons for traction, making him sure footed and able to be agile with a long frame. Ares has ears a tad larger than the average size, sharply pointed more than rounded. This masculine towers over petite females, and has a few inches over each male. While much of his body is longer or larger than it should be, his tail is no exception. It's quite long, the tail-tip almost touching the ground. Though you will almost always find it coiled confidently over his back. F U R - T E X T U R E : Ares' pelt texture is nothing too exquisite. It's the common two layered structure of a timber wolf. Trapping heat in winter and cool air in summer to keep him content and well ventilated year round. It has a silky feel to it and is rather soft. 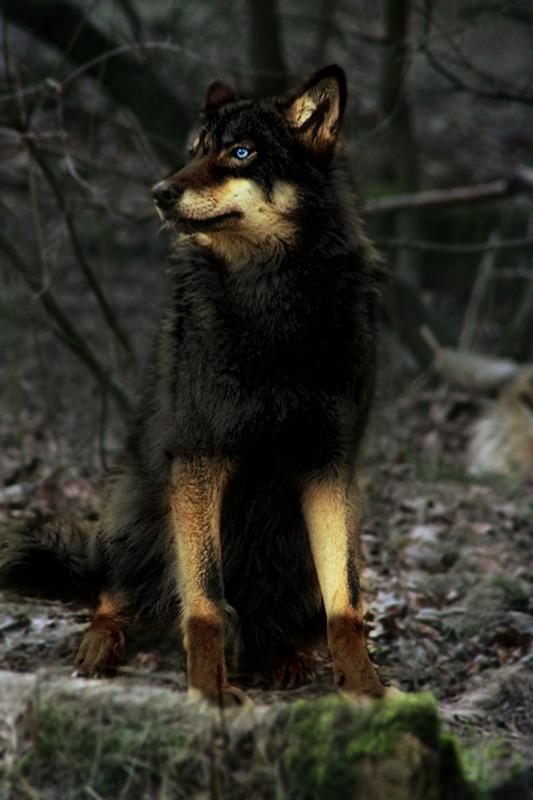 P E L T - C O L O R : When a young pup, Ares was a common timber wolf shade- though as he grew the pigment changed. His legs under muzzle remained a faint tan. While his ears, paws, and top of muzzle darkened into an intense chocolate brown. Though the most dominant color would be his black-grey tinted face, back, tail, underbelly, and rib cage. I R I S - S H A D E :Ares' eye color is a bright, intense silvery-blue. Though seeming to be an icy color, his gaze actually holds a subtle warm look. Small flecks of silver can be found scattered through out his eyes. In the light of day, Castor's eyes look like a pale sky blue, or clear water. Though in the luminous glow of the moon, they appear more silver. S C A R S - OR - M A R K I N G S : Ares' frame is the host of numerous healed wounds, small and large scars coat his body from war. Though his pelt has grown in nicely and covers all former injuries. Roughly 10 years ago, two nomads crossed paths, whether by chance or fate - they bonded. One was an achromatic pigmented male, Alastor- a base of white with black markings. With eyes of icy blue. The second, his soon to be mate, was a sun kissed she-wolf named Oaklee. 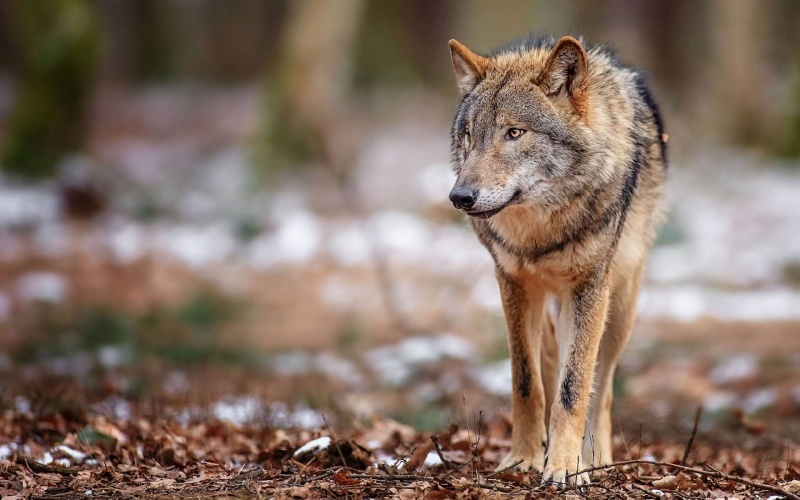 The duo of dispersal wolves traveled to countless territories, being welcomed and chased off several time - but none of the areas seemed to fit them. There was something special about them. Not only were they strong and agile, they were wise and gracious. They survived better than most could, in all types of conditions. After crossing paths with other loners, they began to follow Alastor and Oaklee, seeking guidance and care. The pair did not refuse these desires - the led their pack of nomads with divine chivalry and outstanding protection. A group of dispersal wolves are not always welcome, many battles and many friendships happened along their way through Canada. Soon though, they found a land where no one resided - the prey and water was plentiful and they deemed it their own. Once settling, a clan hierarchy was established, with Al and Oaklee on top as dominants. It wasn't a surprise that the pair were decided upon to be leaders, and the decision upset no one. They lived for a year before anything major happened, but soon - their first litter was born. And nearly every year after they birthed a large healthy batch of pups. Finally - it was time for Ares' liter. And actually the last litter birthed by the alphas. They were now 9, though still quite active in their lives. Ares was one of only two pups. The other was an all white she-wolf named Essence. 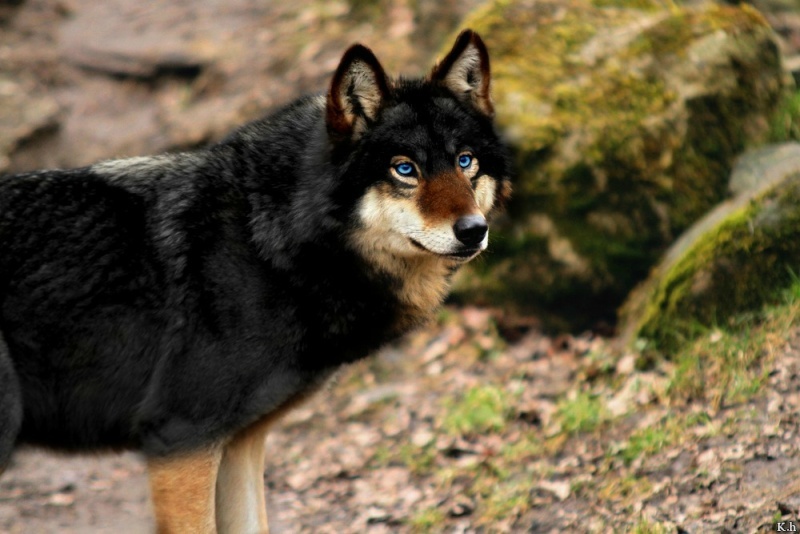 All of Ares elder siblings have left the pack aside from the twin males a year ahead of him. Eros and Cronus - both commonly painted timber colors. Eros' was positive he was destined to be the future alpha and Cronus beta. Though for some odd reason, many of the elders and authority figures of the pack held interest with their leaders' last born liter. Essence and Ares. Throughout their first three months - Ares recalled all of them meeting with he and his sister each day. Poking at them with their noses, rolling them over and observing each aspect of them. It was like that until the reached 6 months of age - they then began to observe from a distance. Ares and Essence were taught to hunt and fight - which angered Eros and Cronus - for they were not taught until one year of age. The silent jealousy never ceased in growth. Whenever taught a lesson, the elite group would lurk and watch the young duo. At the age of 8 months - the eldest wolf and wisest of the pack came up to Ares and his parents. "It is time." They gray stained wolf spoke then left. "Time for what?" Ares asked frantically, full of confusion. His parents simply smile and said to follow them. 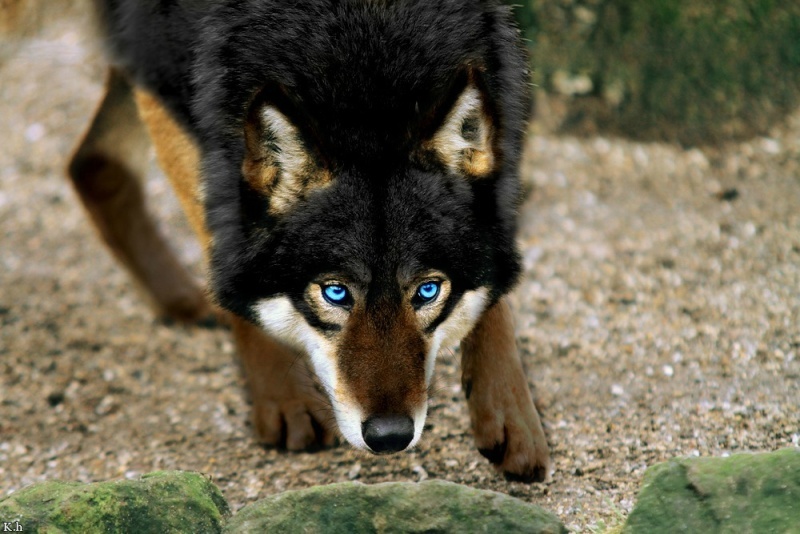 Soon Ares was at his pack boarder - his pale azure gaze darting with each step. "Come out young one." Ares soon saw a young she-wolf of the neighboring pack. 'Kallista?' The black and white she-wolf's name was faint in his mind. They had meet long ago, she was the heir of the pack nearest to them. "We are going to unite the packs, and we believe you and Kallista should adapt to the change, together." Spoke his father with kind bow to the heiress of the now joined pack. It was meant to be an arranged mating - a set alpha pair for the future, though Kalli and Ares knew nothing of that. For the next four months - they bonded - becoming more of a brother and sister than a potential pair. Ares looked after her and Essence the same, as he did all females in his newly grown pack. The year older Eros and Cronus never stopped their envious ways, and soon both lusted after Kallista in secrecy. Taking any chance to get near the young she-wolf. One day Alastor, their father, approached them "You are now two, tell me, when will you travel and begin your new lives" Eros was a clever and cunning male, and Cronus brute strength, they smiled coyly and replied "In three days time Father, then we shall disperse." It was set, they were to leave. But not before they got what they wanted. The night before their departure, they scouted out Kallista. Finding her in a solitary den for her own privacy. Together, they took turns holding her muzzle shut while the other had their way with her. The actions took all night. The next morning, Ares was off to wake his friend when he found her practically lifeless. Her muzzle was punctured all around, claw marks covered her rib cage. The she wolf had no strength to speak- though the tainted stench of his brothers lingered profoundly. Ares hissed a snarl and charged out of the den, and tracked his siblings for hours - eventually a whole day, finding them miles away. He knew what they did, but they didn't feel threatened by their younger still growing brother. Ares fought them, and won. Each brother hung onto life by thread, low whines echoing from their carcass like state. "If you ever step foot on my land again, I will be sure to end both of your lives." With these words, Ares left his brothers. He returned home, and explained what had happened. The alphas, heartbroken, still thanked their son for his protective actions. From that day, Kallista never trusted a male other than Ares. Over the next six months - Essence and Ares grew closer to Kalli as they cared for her. But soon disaster struck. The alphas fell ill, and the shamans could do nothing to cure it - only slow it's harmful symptoms. Ares, Essence, and the whole pack watched as their beloved leaders passed on. To which leader to Ares being alpha, and Kallista the alphess. Though they were not mated, nor would they ever be, they ruled just as divinely as Ares' parents had. Through the next six months - they greeted and welcomed many into their family. Never experiencing any real trouble. Until a few weeks after Ares' second birthday. Their was silence in all the land, the animals had fled. Ares knew nothing of what caused this until his guards gave the warning. A pack was on their way here, and they weren't being subtle or friendly. 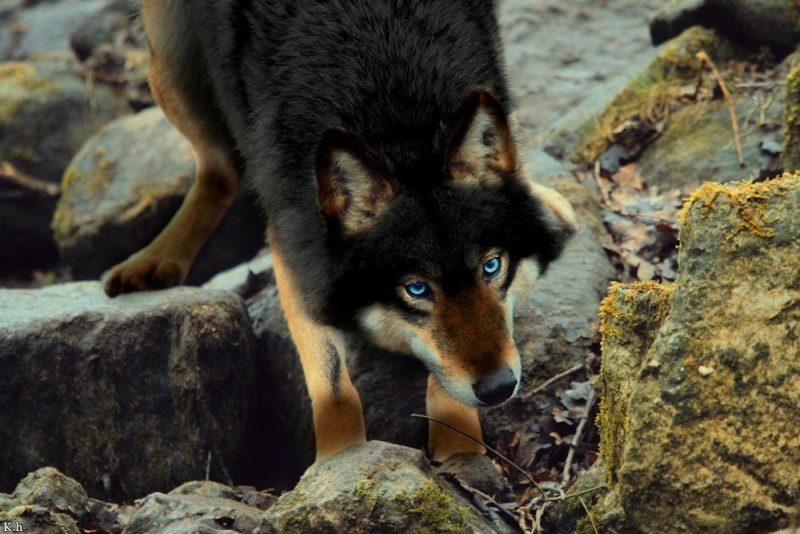 Ares ordered Kalli to go into the den with the younger wolves, he went out to the battle field. It was Eros and Cronus. They had formed their own ruthless pack. "You received everything that we deserved!" Eros snapped the words towards Ares - "I told you if you step foot in my land I would kill you!" Ares growled in a dominant tone. "I'd like to see you try!" With this threat, Eros and his pack charged forward and the war was on. Hours later, half of each pack was gone. Essence and Ares fought along side one another against Cronus and Eros. It was when Cronus had pinned Essence, that Ares' adrenaline and protective nature peaked. Ares wasted no time to end his elder brother's life, and soon he ended Eros as well. The war died down, and the former pack of the evil brothers dispersed or requested access to join Ares' pack. To which he granted. Ares was only two years of age - and he had witness death, murder, leadership, and much more. The wolf began to wonder if this was the life he desired. One night he spent time talking with Essence and Kallista- to which they all agreed it would be okay to leave together. The three of them. The beta wolves would take over their positions. 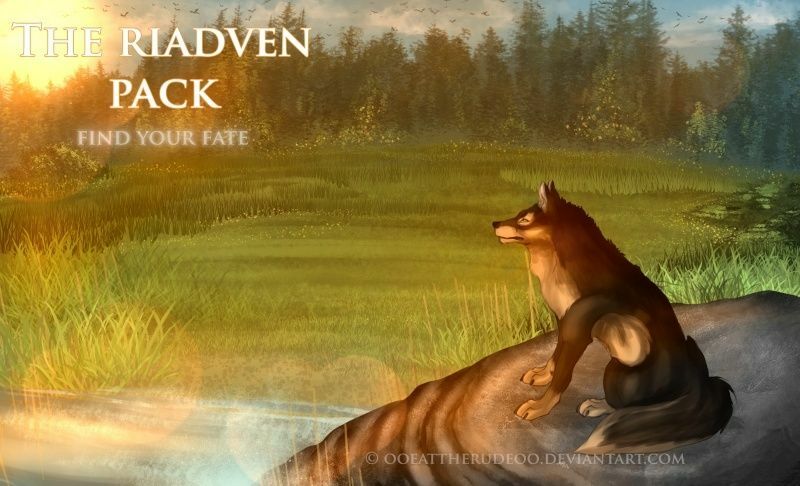 Once announcing their plan, the pack did not stop them, they encouraged their choices. After a few months of travels, they entered a new pack. And decided to stay. During which, Kalli met a young male wolf and fell in love. Essence began to take lessons from the clan elder and saw them as a type of parental figure. While Ares took an interest with the pack's newest beta. A she-wolf named Echo. 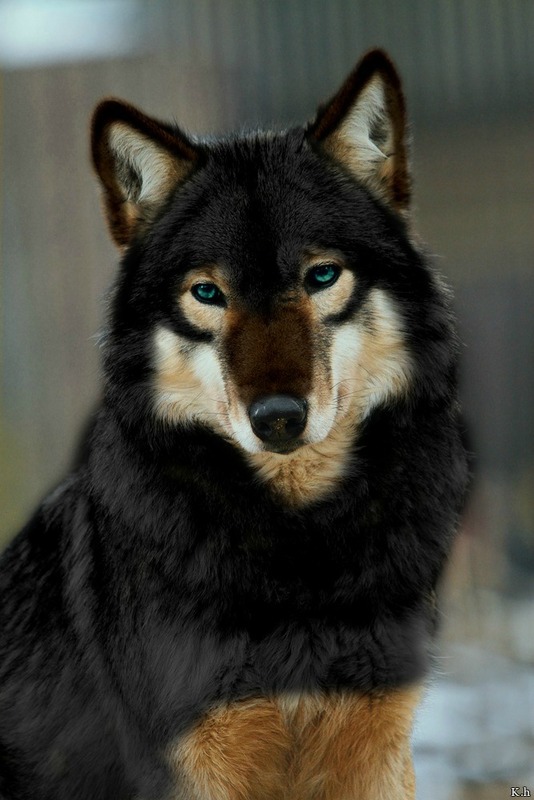 A golden and black pigmented timber wolf. For a month, the two of them secretly saw one another. 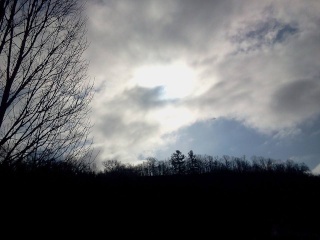 But Ares never knew why, he assumed because he was the new guy, and she was a higher up. But soon he found the real reason. One night the Casanova decided to surprise his love interest, sneaking into her den to see her. As he neared it with a single flower in his maw, he realized why he could not be with her. She was being affectionate with another male. The lead hunter of the pack to be exact. Ares growled towards the act, and the following day when he was meant to meet the she-wolf he growled insults at her for her poor actions. When a wolf over heard his words, they informed the lead hunter. Hours later, Ares was confronted and attacked. The hunter had forgotten that Ares was a hunter in this pack, though new, he still knew what he was doing. When the battle was over, the hunter was nearly dead. Kallista had to force Ares to stop. Once in a fight, Ares taught himself that it wasn't over until the other was dead. After the quarrel, Ares decided it would be best to move on. Leaving Kallista and Essence to live out their lives there, happily. Ares soon found a female dispersal, she was rather young no more than a year, but had two pups with her. She went by the name, Eos. And her two pups Wisdom and River. From what Eos had said, she was impregnated by a savage male and fled the first chance she got. She was one a year old when she had the pups. The 2 and a half year old Ares began to look after the trio. As if they were his own family. They stuck together for 6 months. Until reaching a new pack land. Eos and her pups were accepted to stay. Though Ares wished to keep traveling. He said a hard goodbye to his adopted young and dear friend Eos and left them. Weeks later, traveling into Riadven. Ares is actually a rather sweet and kind wolf, he is commonly known as a flirt - though he strongly disagrees. He rarely has actually romantic interest in female's. But he is surely the big brother type. He see's many female's as family. Since he was born, he had Essence to look after. And as he grew older, the brotherhood nature still flowed in his veins, making hi favor females simply because he is protective of them and cares deeply. He is highly over protective of all his friends and family, especially females close to him due to what happened to Kallista when he was young. He does have trust issues with she-wolves but only when romance is involved. He doesn't have the best past with love and such. And if he ever sees a male poorly treat anyone, he would not hesitate to attack. The only reason Ares chooses to be a hunter is because if he ever got into a fight with anyone, even a sparring match, his brain has wired itself to believe the fight is not over until the other is dead. When he let his brother live, they came back and killed much of his family. Making him realize he should have killed them when he had the chance. Though highly kind and caring, if Ares is involved with a fight, he will not hesitate to kill. Over all, Ares is the type of wolf you would willing open up to. His easy going and welcoming nature make him a wonderful wolf to get close to. He welcomes ll to speak with him and would never lie about anything. He is honest with all and would answer any question asked of him. He would give his life for basically anyone if he believes they are a good soul. He does his best to not falsely judge and gives everyone a chance. S C E N T : Ares smells of his home land - heavy rainfall in a large forest, like damp soil and faint wild flowers covered with dew. He's like your own personal scent of spring air all year round. V O I C E : Ares' voice is deep, though not coarse. It smoothly rolls from him tongue as he speaks, though many deep voice are intimidating- his voice is subtly soothing and calm. Making him easy to talk to and many enjoy listening to his tone when in some sort of bad state. Being able to calm wolves down when mad or upset. His howl is loud and powerful, it ringers thunderously, though still has that calm, smooth flow to it. DUKANE I SWEAR IF YOU LEAVE DEYA RIGHT AFTER YOU SAID YOU'D ALWAYS BE THERE IM COMING TO DETROIT AND KILLING YOU. It happened, but he took Deya with her. I feel you on so many levels Mave.